The Perfect Horse News: How does The Perfect Horse "E3AFA™FOR HORSES" work? How does The Perfect Horse "E3AFA™FOR HORSES" work? There are several reports of AFA (Aphanizomenon flos-aquae) helping a wide range of physical and mental symptoms, it is easy to assume the "quick fix" mentality associated with Doctor prescribed pharmaceutical drugs. AFA is a single-cell organism with a full spectrum of over 64 perfectly balanced, naturally occurring vitamins, minerals, amino acids (protein) and essential fatty acids. AFA helps restore overall biological balance and nourishes the body at the cellular level. The Perfect Horse "E3AFA FOR HORSES" has a 97% absorbency through the body, without any toxicity or side-effects! Compared to Human-made vitamins which are about 5% - 25% absorbency , this is how AFA can have so many beneficial nutritional and energetic effects throughout the body. 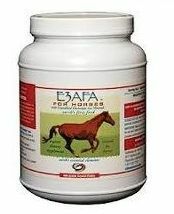 460 gram size This is our most economical size of E3AFA™ FOR HORSES. For a healthy horse this size can last you up to 8 months! That's less then a $1 a day for 8 Months! HORSES over a given period. Unless you know the source of your AFA (Aphanizomenon flos-aquae), there is no guarantee of quality. E3Live FOR HORSES Products are harvested by the most competent harvesting team, and staff of engineers in our industry. **Note: It has been documented that only a small portion in AFA is bioavailable. ***Note: Trace minerals are required in very minute amounts for proper physical function.